UNIQUE D�COR- The gnome statue leans casually against a mushroom with a cute frog perched on top; it�s a wonderful conversation piece that adds a whimsical touch to any flower bed, fairy garden, backyard, or front porch! STURDY CONSTRUCTION- Made from a durable high-quality Resin material that is designed to prevent cracks, chips and fading, this gnome sculpture will withstand any weather conditions. INDOOR OUTDOOR USE- This intricately detailed gnome statue is lightweight and can conveniently be placed inside or outside the house. This adorable figurine is a fun way to add a little magic to any home or garden! 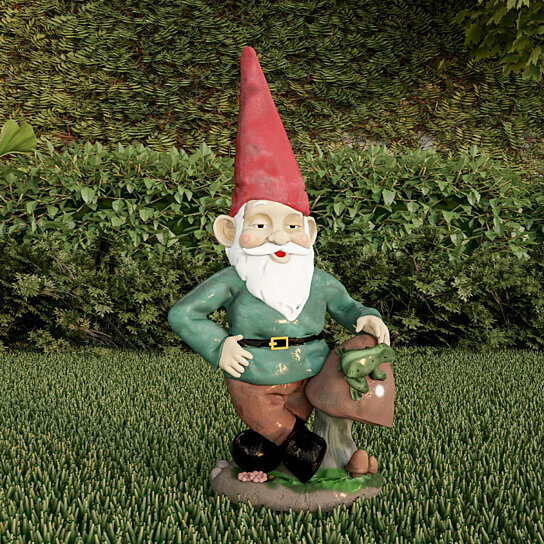 GREAT GIFT- The delightful gnome statuary is a wonderful gift for holidays, birthdays, housewarmings, or any occasion. Your friends or family members would adore this classic and charming yard decoration. PRODUCT DETAILS- Material: Resin. Dimensions: (L)7.5� x (H)14� x (W)4.5�.